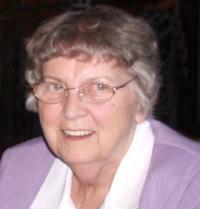 Joan Patricia Jeneroux, 87, passed away peacefully on April 19, 2014 in Edmonton. Joan will be lovingly remembered by Frank, her husband of 66 years and their family, son Doug (Jayne) and their children, Matthew, Bernadette and Ryan; daughters Patti (Laurent Amyotte) and their children, Vanessa, Natalie, Josée and Pamela; Darlene (Dave Robinson) and their children, Thomas, Lindsey, Lisa, Laura and Corey; and Sharon and her children, Kara and Wyatt; as well as their five great-grandchildren, Molly, Lily, Addison, Scarlett and Lily; and Joan’s brothers, Percy and Ken (Silke) Taylor. The family wishes to thank the staff at Shepherd’s Long-term Care for the kind and loving care that Joan received.